ABH3(AW) Nicole Liskey was born and raised in San Bernardino, CA before she and her mom moved to Bellevue, WA in 1997. Nicole graduated from Newport High School in 2001. She first joined the Navy in 2006, and in May 2007 reported to her first command, the USS Nimitz/CVN 68 based out of San Diego, where she started out as a blue shirt in Fly 2, and was promoted to UI tractor driver before she was snatched up by Crash and Salvage. There she worked her way up to P25 driver, and spent her last 8 month deployment as a crew leader. Three deployments in three years later, she decided to get out in 2010 to pursue a college degree, and in March 2013 graduated from Everett Community College with an Associate in Applied Sciences. In July 2013, Nicole enlisted into the Reserves as a YN3. After deciding that that wasn’t enough military for her, she applied for an Active Duty ABH billet in November 2013, and enlisted back into Active Duty on January 3rd, 2014. Soon after, she received orders to the USS Makin Island/LHD 8 based in San Diego. The Makin Island is currently on a scheduled 7 month deployment to the Arabian Gulf. 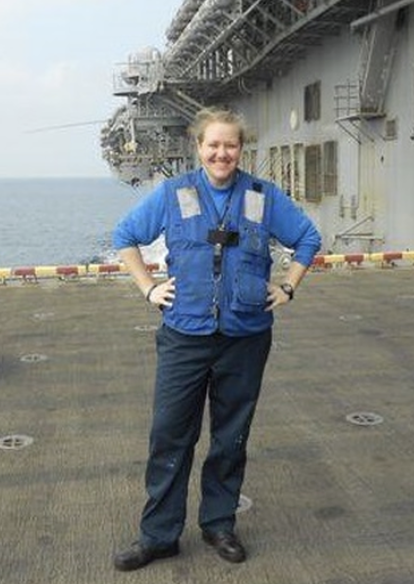 ABH3 Liskey is billeted to V-3, but spends as much time on the flight deck as she can fit in to her schedule. In May 2014, Nicole married ABHC(Ret.) Eric Liskey, and hopes to carry on the family tradition by being the third Liskey to put on the coveted Khakis.